Sri Lanka Tourism Promotion Bureau has successfully concluded a two-day promotional mission to Saudi Arabia as part of its on-going efforts to develop new markets and increase the number of visitors and spend from the region to Sri Lanka. 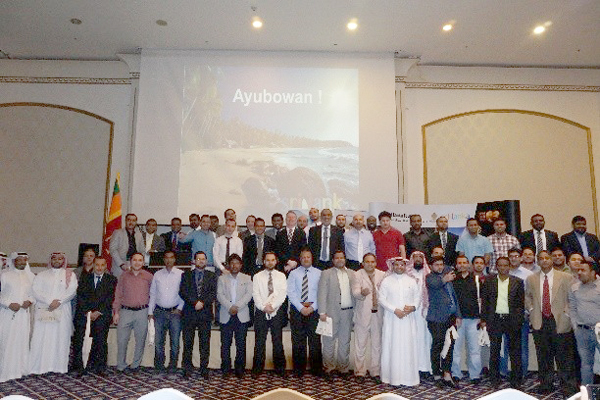 Headed by Anjantha Ratnayake, assistant director, Sri Lanka Tourism Promotion Bureau, a delegation of 20 partners from Sri Lanka’s tourism and hospitality industries visited Dammam and Riyadh and held the roadshow at Holiday Inn Corniche and Holiday Inn Qasr on April 8 and 9, holding one to one meetings and informational seminars with leading travel agency representatives and outbound operators in each city. In 2017, Sri Lanka received a total of 78,873 tourists from the Middle East region with Saudi Arabia topping the rank with the most number of tourist visitor arrival from the region with a total of 35,481 visitors. Currently, there are 28 direct flight services a week connecting Saudi Arabia to Sri Lanka, suggesting the potential to grow and develop the market further, especially as travellers from the country on average have one of the highest travel spends in the world. This will result in not only return dividends for Sri Lanka’s tourism and hospitality industries, but also for the retail industry. In each of the cities visited, over a hundred key outbound travel professionals attended the Sri Lanka Tourism workshops and seminars to learn more about its touristic offerings and business opportunities. Both events were also attended and supported by Sri Lanka’s Ambassador to Saudi Arabia, Mohamed Azmi Thassim, along with Sri Lankan commercial secretary to Saudi Arabia, Gayan Rajapakse. A total of 13 industry partners from Sri Lanka-based tourism and hospitality entities joined the roadshow including Aitken Spence Travels, Isra Holidays, Centuria Travels, I Am Sri Lanka, Araliya Green Hills Hotel, Explore The Wonders, and Asian Adventures Travel Management Company, among others.